Family-friendly places like Adventure World Perth Australia and Cottesloe Beach will thrill your kids. 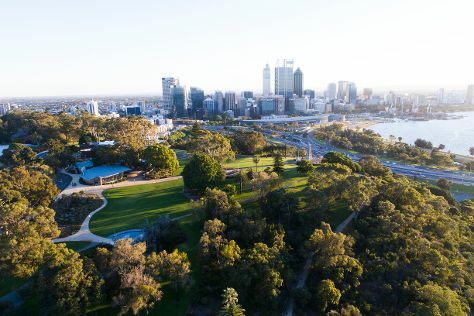 You'll find plenty of places to visit near Perth: Dolphin & Whale Watching (in Mandurah), Rockingham (Penguin Island & Rockingham Beach) and Caversham Wildlife Park (in Whiteman). Dedicate the 26th (Thu) to wine at some of the top wineries in the area. There's still lots to do: walk around Kings Park & Botanic Garden, take in the waterfront activity at Hillarys Boat Harbour, appreciate the history behind Kings Park War Memorial, and explore the galleries of Fremantle Prison. For traveler tips, ratings, photos, and tourist information, read our Perth trip planner. If you are flying in from Singapore, the closest major airport is Perth International Airport. December in Perth sees daily highs of 35°C and lows of 17°C at night. Wrap up your sightseeing on the 31st (Tue) to allow time to travel back home.